Where do Puffins sleep when they are at sea? The sleep while bobbing around on the surface. They don’t sleep for long periods. They take small naps and sleep in spurts. Puffins come back to the same place because it is built into them to do so. Just like you can find your way around your awn neighborhood. Many creatures do this besides puffins. Falcons and Salmon both find their way back. So do some kinds of pigeons. Puffins can hold a lot of fish in their bills. We have seen up to 14 here, but it is possible that they can hold more. They are amazing swimmers and can dive 120 to 180 feet. Amazing! Puffins would probably not make great pets. They would want to be either deep in a burrow our out at sea, so they would not be very happy on land or in a cage. Best we come visit them where they are. Does the horn bother me? Not really. I’m used to it now, just as many of you are used to the train passing by. It is fun to sleep in a lighthouse! 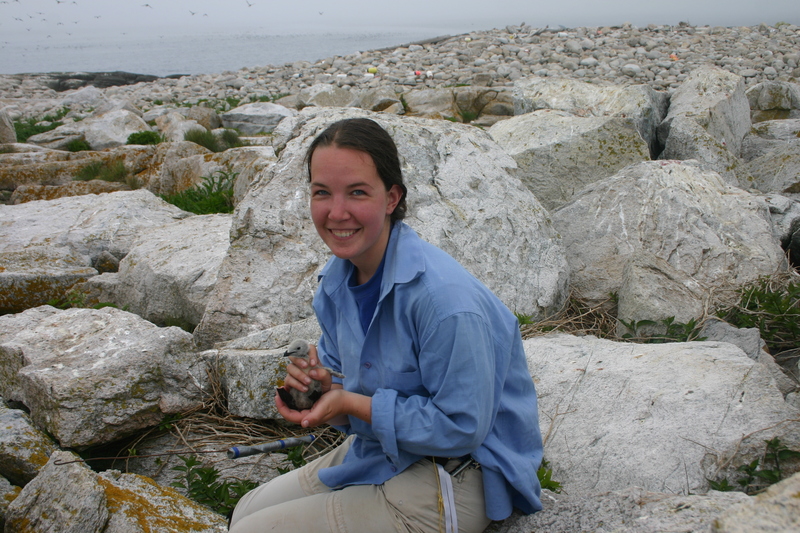 Today we spent the day visiting a razorbill colony on the north side of the island, and I got to hold a chick while we weighed and measured it. Want to see? Click here for a video. Next, I went to a Puffin Burrow. Here is a video. What a surprise! 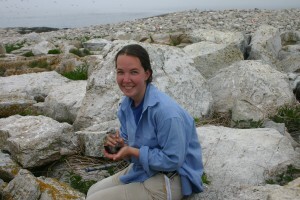 Here is Anne Rohn holding a razorbill. The rest of the day was spent re-sighting banded birds. Today I tried Common Terns. 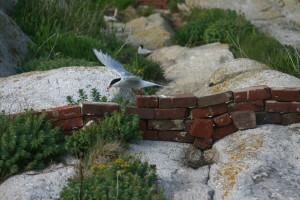 They are much more active than puffins. They move a lot, squawk a lot and were constantly moving around with fish in their beaks. Click the photos today to see! As you can see we work with many species of birds besides puffins. Why do you think we need to work with so many different kinds of birds? 72 Responses to Baby Chicks Arrive! It’s strange to see you wearing layers of clothing when it’s so blisteringly hot here. There is no AC in the computer room. What’s the temperature like where you are? I wanted to ask if you’d go in the ocean to cool off, but it looks like you all are cool rather than hot. I learned that puffins eat small fish, such as sand eels, herring, hake and capelin. I also learned that a puffin can dive for up to a minute, but most dives usually last 20 to 30 seconds. The coolest thing I learned is that a puffin can fly 48 to 55 mph. What is the average height and weight of the puffins you have measured? I think that they use different types of birds so they can compare and contrast them. When you picked up the razorbill, why didn’t he try and snap at you? 1. I think that the scientist study other birds besides the puffins because they want to see the food chain and if it is similar. Or they might want to see if the other birds alike to the puffins. That is why I think that scientist is studying other birds besides puffins. 2. 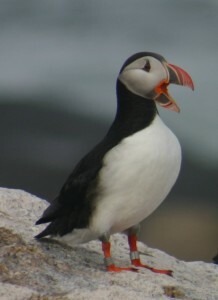 Are there many puffins where you are up in Maine? Did you ever see a puffin carry more than 10 fish over where you are in Maine? •	I think that scientists need to work with so many birds because they can test where they were born, and how they act the same and differently. If you worked with the same exact bird, it would get a little bit boring. •	How many puffins did you see when you got there? Were they babies or adults? Are you enjoying your stay? 1. I think that scientists study other birds is because you can figure out the food chain and some information about other birds. If you spend the whole time looking at one bird then you will know almost everything about that one bird but there is a lot more types of birds for you to look out. 2. I remember you saying that a puffin comes back to the same place where it’s born when the puffin gets older and is ready to have babies. If the puffin is born in your hand will it come back to your hand when it is ready to have babies? 1. I think scientist should study other birds besides puffins because they could see what is part of there food chain down in Maine. To see what type of foods you could see the other birds eat instead of just puffins. 2. What type of fish do puffins eat? Was it hard to find the puffins nest??? •	I think the resin that they have to work with so many birds to see if they are different from each other or if they are hurt! •	Do you enjoy working with the puffins is it hard to mark the puffins with paint! What is the puffin’s dangerousest enemy? 1)You study different kinds of birds because, if something happens to a bird species they know what is wrong and they know how it can be fixed. 2)Is the baby bird normal sized or if he\she has any problems, and if so which ones. 1. I think scientist need to study different birds in 1 area to understand the food chain. 2. How old is the puffin you held? What type of diseases have you seen in the puffins? #1: I think that the reason scientists need to work on so many different types of birds is to see how they are all needed in the ecosystem, and where they are in the food chain. #2: Can a puffin get a fever, or any other type of human sickness? Can they catch something from the scientists that are touching them? If so, What? 1)	I think scientists need to work with many different types of birds because they need to know what birds could be connected to the puffin and since all birds are all kind of in the same ecosystem it would kind of be all connected. 2) Would puffins be able to communicate with you? 1. I think scientists need different types of birds when they observe so they can compare. 1) I think that scientists need to study so many birds because if they only studied one, they would only know about that bird. If scientists study more than one bird they will not only learn about the bird but also about the eco-system and how the birds, maybe, evolved from each other. 2) If the paint falls off with the feathers, how does marking them help? I think that the reason scientists study different species so they can compare the different species. All species are different. I think that they look at other birds to compare the birds. How big are the barbs on the puffin’s tongue? Have you been able to look into their mouth? Can you take a picture of a puffin’s tongue? They do that because they could see the difference of each birds? Wouldn’t a predator come and get the baby bird? If you touch the barbs would it be sharp to cut your hand? I think that scientists observe different birds so that they can check the entire ecosystem. How tall is the razor bill that you tagged? I think that scientists observe at different species of birds because the birds are part of its food chain. When did the razor bill you tagged hatch? 1. I think scientists need to work with so many kinds of birds because they need to find out birds habitats and about their species to share with the world. 2. How many chicks were in the nest of the soon-to-be-named bird that you measured? I think that scientists should work with different birds because they need to study the puffins comfort zone. What do puffins and other birds have in common? 1.I think they work with different kinds of birds because they need to see the different species and see how differently they live. 2.If you had a choice, would you rather work with adult puffins or chick puffins? Scientists study so many types of birds because each bird is different and has a different impact on our lives. Does the bird move around inside the weighing bag? 1. Scientists study different types of birds to see if they are healthy and safe. If you were to study only one bird, you would only know about that type of bird. Other birds might go extinct and you wouldn’t know why. 2. When you mark a bird, can the paint just be washed off? Does it hurt them at all? Scientists study different types of birds because every bird is different and does things like hunt food differently. Does it hurt the bird when you mark it? 1. Scientists study so many different kinds of birds because they want to learn more about all kinds of birds. All birds are different and they want to experience more. 2. How do you know where the nests are??!!! 1. Scientists study so many birds because scientists need to know how the birds breed and if their in danger ECT. 2. Did you find any puffin babies yet? 1. I think scientist study so many different birds because they want to know more about the bird they are studding at the time. Also they might want to know if their habitat is doing fine. 2. How do you know where the different birds are when you never been there before? Q1. I think scientists study so many different birds because birds have an interesting habitat to study and a unique life style. Q2. Why do you ban birds with the paint if your fellow scientist(Anne Rohn) said that when the new feathers grow in the paint will wear off? Then how will you know which bird it is? Q2. When do you put the bans on baby birds? Scientists study so many different types of birds because it helps us know how to protect different types of birds and not just one type. Can you please tell me know how you know where to find the birds? They study more than one type because they are all different and need their own care. Could you give the bird a disease by getting to close to it or touching it? 1. I think that scientists study many different birds because it is better to know about many different things than only one thing. 2. When you mark the puffins wouldn’t it be better to put a band on the chicks? 1. Scientists study so many different birds because different birds will have different habits to learn about. 2. Can the baby chicks get some sort of disease from humans? Scientist study birds because they want to get a whole bunch of information to put on a website. and I hope that you are having a good time. 1. They study so many different birds because they want to see how different the birds are to each other. 2. Could the birds get diseases from humans? 1. Why do scientists study so many birds? This because birds are very important animals in our environment. Where would we be without birds? 2. My question is… Where can you find a puffin? Are they hard to find? 1. I think that scientists study so many different birds because they want to know the difference between one bird to another and want to know how their life style is. 2. One thing I would like to know about puffins is, if a mother puffin hears her baby in danger, would she know if it was her baby and would she help her/him? If there was a heat wave what would happen to the eggs”? Would they hatch faster or would they die”? 1) Why does scientist study so many different birds? Scientist study so many different type of birds because birds are very different in there own way like people and need there own care. Could you give the bird a disease by getting to close to it or touching it? Can scientists get any diseases from touching the birds? Scientists study so many different birds because they would want to learn more interesting information about them. (where they live, what they eat and much more). How many puffins are found on that island and how do you know where you know where they are located? when the new baby birds are born do you have to put the bracelets right on them there then? Also do you have to teach the baby birds how to fly or do they learn by themselves. Also when you pick them up do you have to wear gloves? I think you should name the puffin cuddles or fuzzy feet! 1. A scientist studies different birds so they know about all birds not just one kind of bird. 2. I think you should call the baby chick Mimi. I think have to study all these different animals because you need to understand the relantionships between those seabirds. Do puffins always dive that deep to get food or can they just scoop down if the fish are close to the surface? How long can puffins hold their breath for? 1) About how many puffins do you see that are banded each day? 2) About how many puffins are thriving at Matinicus Rock? 3) What do you usually eat for breakfast, lunch, and dinner? 4) Where is your favorite part of the island? Do puffins look the same when there born. If no what do they look like. I have a some of questions for you. Who are the scientists that you are working with? What do puffins do out at sea besides eat, sleep and poop? You look at puffins all day. What else is there to do on Matinicus Rock? Scientists study so many birds because if one species is endangered, they will know how to take care of it. What will you study about the baby chicks? Is there any special type of fish that puffins like the most? What is the puffins most dangerous enemy? About how many puffins are on Matinicus Rock? 1. I think you need to work with so many birds because they are all part of an ecosystem. 1)	Scientist study so many birds to see how there life and how its works also how is there life cycle and there prey and predatory. 2)	Why did you use the stuffed puffins the second video in the rocks. Was that a joke??? I think scientists study many different bird because if you are at a place, like where mr.t is why not study many types. It would be a waste of time to have to go back to the same place to study a different bird. Why do puffins breed in holes? Scientists study birds because they need to keep track of the population growth, food sources and the bird’s characteristics over time. 1. I think they study different kinds of birds so they know about different types of birds. 2. What did you figure out about the birds? 2. Why did you protect the body of that bird and not the head? Isn’t it the head that is most important. 1. I think that scientists study different birds because we need to know the animals around us; we need to know if this bird is a threat to us or any animal. 2. How many birds have you examine so far? Scientists study so many birds because they can to figure out why there are so many differences between birds. Why do you mark the birds if there feathers just grow over the paint. I think scientist study so many birds because they what to know were they live and what they eat. What will you do next with the baby birds. I think that scientists study so many different birds because they can study different thing about things about the birds which can help us in the future example they can study the birds flying pattern and they can think about how engineer better planes and they can watch a birds eating habit and figure out how to save birds who may be eating the wrong things like plastic. That’s why I think that they study so many different birds. Mr. T why do you guys have to measure the bird’s weight because I thought the trip was all about puffins? 1. I think scientist’s study so many different birds are because they want to know how they grow and if the bird is healthy or not. 2. What do you like about being there? 1. The scientists study so many different birds because if they are unique. Also if they mate they can study the baby. 2. Have you ever seen a bird with disease or is sick. 1. The scientists study so many types of birds because if two different types of birds mate they could make a different type of animal. 2. Did you see one kind bird that is not a type any other birds that live on that island. 1. I think that scientist study many different types of birds because birds are part of the food chain and if any of the birds are unhealthy then the food chain can get messed up and if the food chain isn’t right the a lot of animals and some people could die. 2. What do you (Mr. Tanenbaum) like about being there. I think scientists study birds because they want to see there living patterns including eating and sleeping. They also want to learn to see if they do the same things. Do the birds at the island change there feathers colors during the seasons. I think scientist study birds because they want to see there lifestyle they eat . Do puffins get sick at some point? i love puffins!!! take care of this egg!! !